1.Multi-mesh bag in the bag, practical and handy. 2.This compact cosmetic bag can serve as a handy travel companion on any trip. 3.Special hanging design, ideal for travel, vacation, business trip and outdoor activity. 4.High quality, waterproof ripstop nylon fabric, lightweight and durable. Large SBS zipped main compartment for easy access to your toiletries. 5. Upper half with a hook to hang it in the bathroom. It consists of an inner zipper compartment for moisturizer and shampoo, lip balm and other small thing suits. 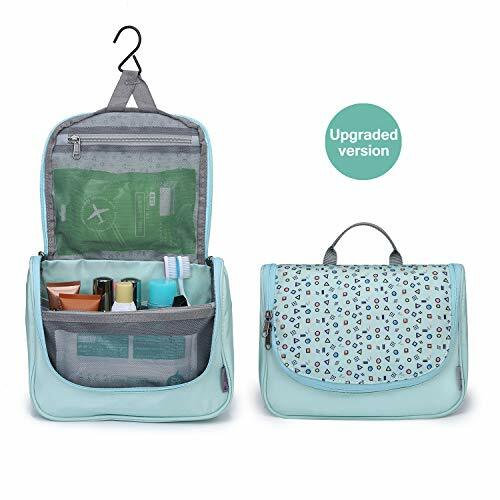 6.This toilet bag is the perfect travel companion for carrying all your necessities washing, whether you're on vacation, away for a weekend or on a business trip. 1.Water-repellent coating fabric. Please do not wash with dishwashing liquid or bleach. 2. Clean with a damp cloth. 4. please do not iron.